As ever when Brits travel to sunnier climes, the fascination with the temperature prevails and value for money when eating and drinking is an added bonus! The two 13 peseta stamps feature King Juan Carlos I and are from the 1976-84 definitive series. Another, earlier one from Janet who I have known for around 45 years! 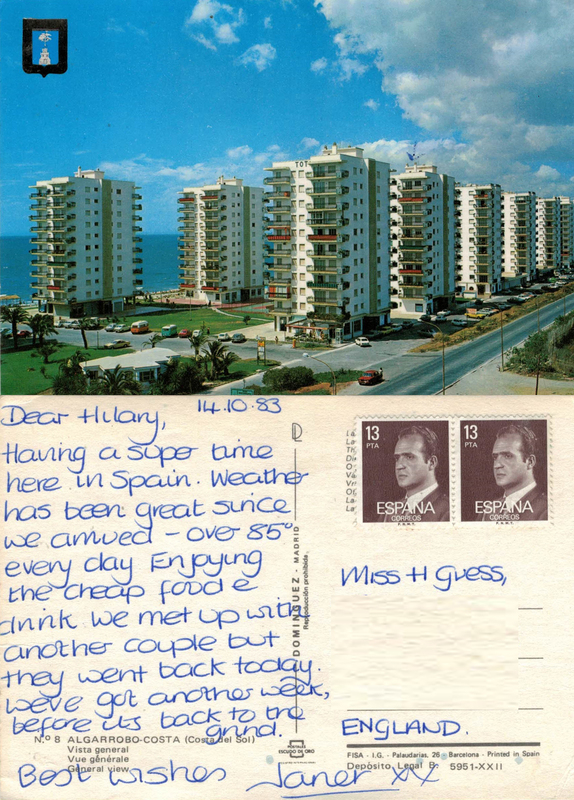 This entry was posted in autobiography, Deltiology, Friendship, holidays, Life, Nostalgia, People, Postcards, Social History, Travel, writing and tagged Algarrobo, autobiography, friends, friendship, King, postcard, postcards, Spain, travel, writing. Bookmark the permalink. I remember these stamps. I was struck by how distinguished he looks, and well kingly!